and I will be there to comfort you. enfolding me in His arms of grace. Photo taken inside the church of the Holy Seplechure, Jerusalem, Israel in May, 2001 while on my trip there to Israel. Don’t be afraid, for the road you take you won’t take alone. I want to tell you, I’ve walked this way before when I carried the sins of all. With brokenness in spirit I struggled carrying my cross up the road. And your sins? Forgotten, and no more, for I’ve born those too, you see. You are free. I paid your price. You’re not alone if you’ll walk this road with me. I came to save and redeem the lost if they believe. It was all prearranged by my Father at Calvary. Matthew 28:5 & 6 – But the angel said to the women, Do not be alarmed and frightened for I know that you are looking for Jesus, Who was crucified. He is not here; He is risen, as He said He would do. Come, see the place where He lay. He is risen indeed! 🙂 The story of Jesus’s death, burial and resurrection can be found in chapters twenty-sixth through twenty-eight of Matthew in the New Testament bible. I hope you have, and know the peace and joy that only Christ alone can bring, and I want to wish you all a happy, blessed Easter. without those things that bring us strife. towards the assurance of new life. 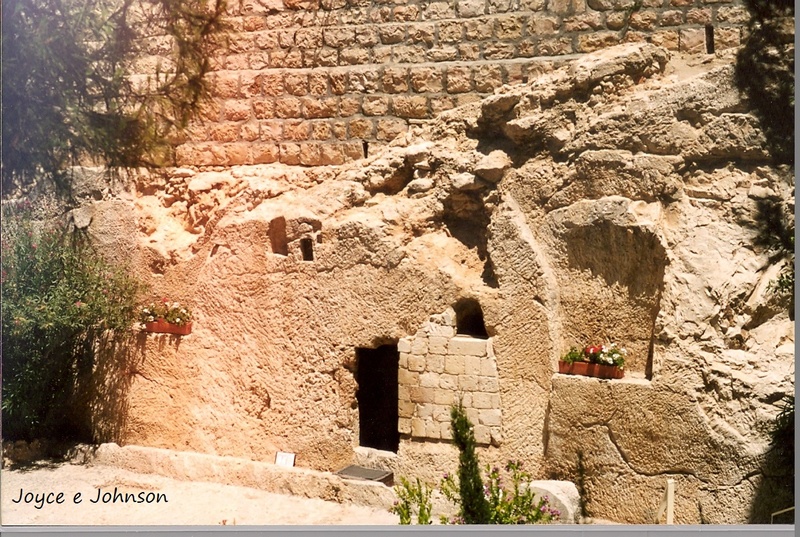 The Garden Tomb of Jesus in Jerusalem, Israel: photo taken May, 2001 while on tour of Israel. and from the clutch of sin be free. and be crowned King of Kings. The story of Jesus’s death and resurrection can be found in chapters 19 & 20 of the book of John in the New Testament Bible, NIV. I wish you all a happy, blessed Easter filled with hope, peace and love. Footnotes: The life and history of Jesus, his miracles performed, his ministry on earth, and the story of His crucifixion and resurrection can be found in chapters 14-16 of the book of Mark in the New Testament as well as other parts of the gospels of Matthew, Mark, Luke and John. I want to wish everyone a happy Easter and hope your day is filled with hope and joy in knowing the One who sacrificed His life to give us eternal life and peace. What do you think He would post? How many ‘likes’ and ‘follows’? How many views? Do you think He would post to Facebook, WordPress and Twitter, put pictures, awards or success stories up to promote himself, or be found in the search engines of Google and Bing? Jesus never needed to promote himself. He humbled himself and people were naturally drawn to Him by the thousands. At times I wonder what it would have been like to have been born back then when He socialized with tax collectors, rebuked the critical Jewish pharisees and ministered to the crowds of people in the villages of Israel, or on the streets of Jerusalem with his disciples. Would we just watch and accuse Him like all the rest while He carried his cross to Golgotha’s Hill to Calvary to be crucified? If Jesus had a blog today, He might use it to tell his parables or stories about what His kingdom is like. He might post the Beatitudes, or His sermons preached to the thousands on a hillside. He might share the memories He had of His life before, photos and stories of His friends and disciples he came to love. Maybe he would share with all how He would leave for a while, be put to death, then be resurrected on the third day and rejoin His disciples and friends again before ascending up to heaven to His father. And in leaving He would promise that the Holy Spirit would always be near to help and comfort us all. Even though we have all this contained in the Old and New Testaments of the Bible today with easy access to all, and in many different languages and versions I think Jesus would have multiple stories to share that there would be no room or time to tell it all. I think He would post stories about people who have been healed of disease and disabilities of all kinds, and stories about restored relationships and marriages that would give us hope to get through difficult or troubling times, how to raise our children and gain wisdom along the way. But, most importantly I think He would tell people how much He loves them. Footnotes: Jesus’s history, his life, stories and miracles performed can be found in the gospels of the New Testament Bible in Matthew, Mark, Luke and John.